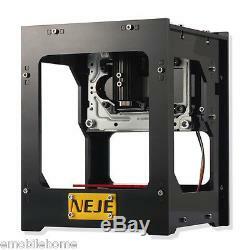 NEJE DK - BL 1500mw Laser Engraver Cutter Engraving Carving Machine Printer. 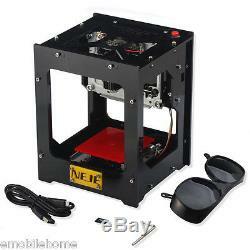 NEJE DK - BL1500mw Laser Engraver Cutter Engraving Carving Machine Printer. 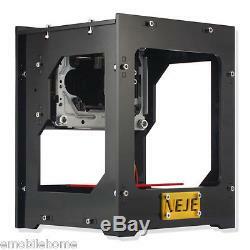 Description: The laser engraver printer machine print of high power and 550 x 550 pixel high resolution. And soft material can print out the 3D and the gradient effect! Unique frame, weak light automatic positioning and frame positioning make the image positioning easier! Good at Engraving depth and image engraving. Main Features: Built-in 6000mAh Li-ion battery, provide 4A output, high power and create anytime anywhere, can be used offline without cable connect any power 42 x 42 x 78mm caving space Laser lifetime up to 100000 hours Materials cutting depth up to 7.8mm With 108 screws and alloy structure, make it strong, also you can design your structure in the machine Power cut memory function. If the battery power is insufficient, use a mobile power or a 5V 1A supply, it will continue to carve Lone time use, NEJE developed the professional power IC and radiator, carving time will last much longer than other laser and more stable Good at image engraving and depth engraving, extremely wide scope of application Can be carved items included: hardwood, plastic, bamboo, rubber, leather, miniature engraving, cut paper and so on (not include gold, silver, copper, and iron) Support Win 7, XP, Win 8, Win 10, iOS 9.0 and above, Android 4.0 and above Specifications: Bluetooth: Bluetooth 4.0 Battery capacity: 6000mAh Battery working time: more than 3 hours Power: 1500mw Caving space: 42 x 42 x 78mm DPI: 350dpi Laser wavelength: 405nm Laser type: impulse Temperature: 500 Deg. C Support software: NEJE Supported image formats: JPEG, BMP (24 bit only), TIFF, PNG (32 bit or less), PCX (8 bit and 24 bit RLE) PCD image size: 550 x 550 pixels Engrave mode: bitmap carving Input: USB (5V 1A or 2A) Frame material: acrylic + aluminum + stainless steel Laser can replace: yes. 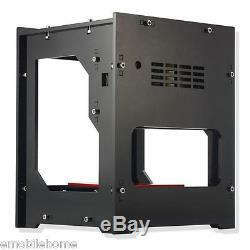 Model: DK - BL1500mw Engraving Area: 42 x 42 x 78mm Laser Wavelength(nm): 405nm. Package weight: 1.692 kg Product size: 14.50 x 16.00 x 20.00 cm / 5.71 x 6.3 x 7.87 inches Package size: 30.00 x 20.00 x 21.00 cm / 11.81 x 7.87 x 8.27 inches. Packing Contents: 1 x Engraving Machine, 1 x Laser Protective Glasses, 1 x Wrench, 1 x Micro USB Cable, 1 x 1GB TF Card (Software / App), 1 x English User Manual. All our products are extensively tested to comply with rigorous and strict QC standards. , we recommend proper supervision as we cannot be held liable for misuse or accidents. We are professional worldwide wholesale company, with our own factory located in China. We supply many products including Smartphones, Android, Apple Accessories, Audio & Video, Car Accessories, Computer & Network, Consumer Electronics, Hobbies & Toys, Pet Supplies, Home & Garden, Photography, Sports & Outdoors, Video Games etc. High product quality, reasonable prices, excellent customer service and a reliable credit standing is our tenet. Happy online Shopping, Thank you! Please write any special request e. We are not responsible for any wrong or undeliverable addresses. Note: Other countries or remote areas may take longer. International Buyers - Please Note. We stand behind every product we sell. Your better comments will be an encouragement for us to offer the better quality and the better service in future. We shall try our best to solve your problem to your satisfaction. The item "NEJE DK BL 1500mw Laser Engraver Cutter Engraving Carving Machine Printer" is in sale since Monday, November 21, 2016. This item is in the category "Business & Industrial\Printing & Graphic Arts\Screen & Specialty Printing\Engraving". The seller is "emobilehome" and is located in shenzhen. This item can be shipped worldwide.